IbVPN's Ultimate plan offers a stack of features for a very reasonable price, but we found speeds were poor over long distances. Test carefully before you buy. Invisible Browsing VPN (ibVPN) is a brand of Romanian-based firm Amplusnet and has been offering VPN services since 2010. The company has six VPN plans. Unlike most providers, these aren't simple variations of the same product – instead they're aimed at very different audiences. The Standard plan gives you 100+ servers in 44 countries, for instance, with wide protocol support and a NAT firewall. This looks very cheap at $3.08 (£2.45) a month paid annually, but there are drawbacks. The plan supports only a single connection at a time, and P2P isn't allowed. The Torrent plan adds P2P support and still costs only $3.08 (£2.45) a month, but has issues of its own. You only get 14 servers in seven countries, and there's still only a single connection allowed. The Ultimate VPN plan combines the features of the other two, and adds a little more: 130 servers in 47 countries, P2P is supported, and you're able to connect five devices at one time. That's much more like the competition, and it's still very fairly priced at $4.83 (£3.85) a month paid annually. It could get even better. During the review we noticed that if we browsed the website for a while, then moved our mouse cursor out of the window to switch tabs, the site displayed an alert offering a further discount to $3.46 (£2.80) a month for the annual plan. We don't know if this is an unusual offer or always available, but try it for yourself before signing up. Three further plans are targeted at families or businesses where several people want to use the same connection. For example, the Family VPN 7 plan allows seven simultaneous connections, and has 130+ servers in 47 countries. There's P2P support, Double VPN and Tor over VPN, but the price is still a reasonable $8.32 (£6.65). There are instructions and apps to help you get the service up and running almost anywhere, and almost 50 payment options, including credit cards, PayPal, Bitcoin and more. The trial gives you only 24 hours to try the service out, but if you subsequently sign up you also get a 15-day 100% money-back guarantee, and overall there's plenty of choice and value across the range. The following, for example, are every single heading and subheading in the policy: Introduction, Information Collected (Logging, Personal Information, Payment, Encryption, Cookies), How We Use Information. It's writing for people, not lawyers, which is certainly refreshing. The contents are clear, too. Limited personal information is stored related to user accounts, but it's not shared with anyone, and the system doesn't log or have any way to relate web activities to a specific user. The terms of service page is more complex, but we ploughed through it anyway and found a few interesting points. IbVPN says its products are only for personal use, and may not be used for commercial purposes. As an extra twist, this even seems to apply to the Small Business plans, as they also ask you to agree to the same terms. There's a similar issue in a clause which says: "You agree not to share or give your user/password to others." How is that going to work in a business or family plan which seems to be aimed at multiple users? Elsewhere, the client blocks SMTP ports 25 and 465 when the service is enabled "to avoid spam from our servers". That's not unusual, but it could mean you need to reconfigure your email to get it working when the VPN is connected. IbVPN gives you just a 24 hour trial, as mentioned, but it's unrestricted and doesn't require any credit card details. Just enter your name, email address and a password and your new account should be activated within 10 minutes. We signed up and were presented with a lengthy list of download options. IbVPN has clients for Windows, Mac, iOS and Android, as well as simple extensions for Chrome, Firefox and Opera. Even if you don't need a particular client, it can be interesting to check the details on each download page. 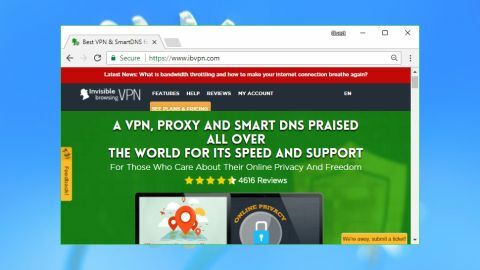 IbVPN made a good impression with its Android, iOS and Chrome software all being updated in the last six weeks, and every package achieved a four-star rating from users. We grabbed a copy of the latest Windows client. This required Windows 7 or later, but there's an XP-compatible version available for anyone who needs it. The Windows client opens with a poorly designed dashboard which is full of options that many people may never use. There are buttons to enable and disable the kill switch and ibVPN's DNS service, for instance. Another large button opens the connection log, and there's a pointless Account button which duplicates another one in the sidebar. These should be tucked away somewhere else, not tying up screen real-estate in the most important part of the interface. As a result of filling the dashboard with junk, the client doesn't have room to display any servers on the opening screen, and it takes another click to open and browse the list. The server selection process is much better designed. The opening list organizes locations by country, and displays a load-related indicator to help you choose. In a click or two you can sort this list alphabetically, by continent, or to view servers optimized for particular tasks: torrents, gaming, Tor over VPN, Double VPN. A simple Favorites tool can mark your most commonly-used servers for easy recall later. Opening the Settings screen revealed some neat touches you don't often see elsewhere. A Rotating Favorites scheme can change your location from one favorite to the next every few minutes. Uniquely, there are two kill switches to help you control what happens if the connection drops. A standard system-level switch blocks all internet traffic, or you can opt to close specific applications, and even restore them when the VPN reconnects. There are two layers of DNS protection, and an option to disable IPv6 traffic. The client is exceptionally configurable. You're able to decide when it launches, whether it reconnects immediately, how its window is displayed, whether you see notifications or the client asks you for confirmation about various actions. For example, initially you get an "are you sure?" message whenever you change locations, but if that gets annoying you can turn it off with a click. Once we were up and running, ibVPN correctly passed all our leak tests, giving us a new virtual location on demand and successfully concealing our real identity. Performance was mixed in our tests*. UK to UK speeds were excellent at more than 30Mbps, and many European countries similarly managed 20-30Mbps, but there were significant exceptions. The client identified the Netherlands as the fastest server, but that barely managed 10Mbps. Sweden gave us similarly below-par results, and UK to US connections averaged 5-10Mbps, around a third of the speed of top rival VPNs.